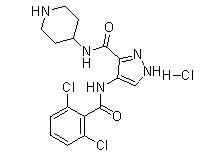 Remarks:AT-7519 is an orally bioavailable small molecule CDK inhibitor with potential antineoplastic activity. AT7519M selectively binds to and inhibits cyclin dependent kinases (CDKs), which may result in cell cycle arrest, induction of apoptosis, and inhibition of tumor cell proliferation. CDKs are serine/theronine kinases involved in regulation of the cell cycle and may be overexpressed in some types of cancer cells.